Would you fly a sponsored airplane? Popular low-cost European airline, Ryanair, has a new plan for making money. The progressive airline has announced that it will start carrying ads on the outside of its 300+ fleet of Boeing 737's. 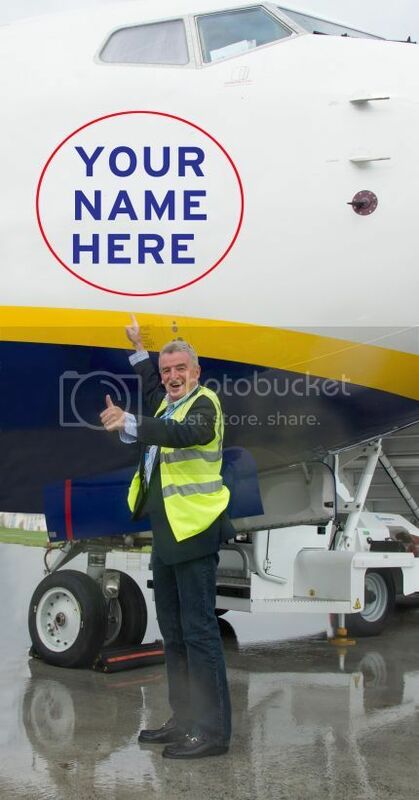 Companies can have their brand featured on four different locations on the Ryanair aircraft, including on the inner and outer winglets, front fuselage and rear fuselage, for a 12-month period. "It's had an unbelievable reaction," says CFO Howard Millar. "Our aircraft fly all over Europe and we're just negotiating with firms over rates and time periods. All kinds of companies are interested, from fast-moving consumer goods giants to telecoms companies. It'll launch as soon as possible. There's just a bit of design work to be done to get the ads ready." This isn't the first time the airline has tried to develop a revenue stream from marketing partnerships, but it's definitely the boldest.